Verdict: Although Kara King is not as messy as his previous film, Hantu Gangster (2012), it’s still not as well thought out and executed as his first one, Nasi Lemak 2.0 (2011). It felt that part of Namewee’s intention was to educate the viewers about the true spirit and meaning of rock but failed to convey it rightfully and perhaps even affirm haters instead. 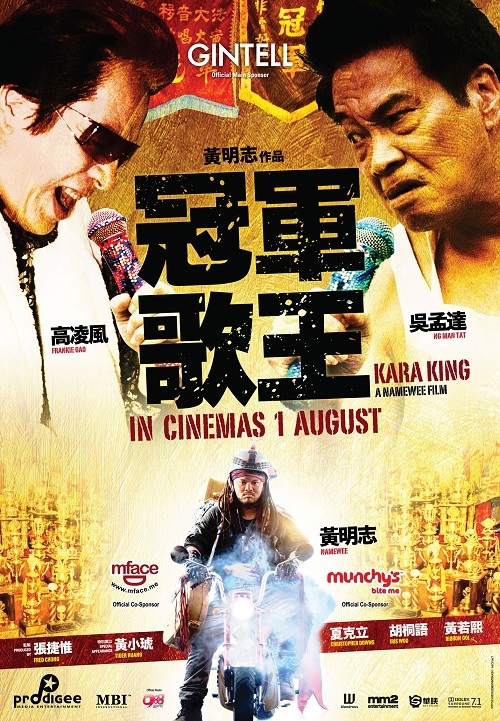 Heavy influences from Stephen Chow are, again, noticeable, making the storyline very familiar. But all of that wouldn’t matter if it’s funny enough… and it’s not. I think even the senior citizens may find that the humour here is too slapstick to appreciate (and no, it’s not the “mou lei tao” type of slapstick). Even Ng Man Tat’s presence couldn’t help much. Namewee’s “Tokok” webseries are way more enjoyable simple ’cause only without restriction can allow him to truly shine. Second opinion: “Liked the idea but Namewee failed to bring it all together properly; the film seems incomplete and it’s not as funny as his previous movies but the songs are good” (girlfriend). Wrong interpretation of rock: In movie, rockers are portrayed as a bunch of useless idiots who vandalise, steal ice creams from kids, steal stuffs from helpless shops, steal utilities, play loud music that annoys people, not caring for their parents, consume drugs and like to drop their pants on stage. There’s no real followup to correct all of that besides the video tape scene that’s so not sufficient. It’s maybe funny to people who knows rock, but those who don’t may start to have a bad impression on rock. I don’t believe Namewee was trying to criticise rock or anything like that but thanks to this movie, at least one more person would probably stereotype rockers now. Possible plot holes [updated]: The Kara King (Ng Man Tat) was doing well by just participating in singing competitions in Hong Kong but after his wife (Tiger Huang) left him, he not only quit singing but left his comfortable home to come to Malaysia and lived a more difficult life with his two children selling pork in a small town just because he thought that this would allow the wife to go on chasing her dreams. He could’ve continued his career to provide a better life for his kids but chose to have them suffer with him instead… I know he did that for the wife but still, realistically, it’s irrational. They could’ve just sat down and talked about it. His son (Namewee) grew up hating him ’cause he thought he allowed the mother to leave the family but after finding out the truth through the song his father wrote, he easily reconciles with both the parents in the end. But shouldn’t he be pissed off with his father for choosing this path for all of them without consent? And shouldn’t the mother be pissed off with the father for taking away their children for 20 years? Maybe I didn’t understand the language well enough to fully understand the story but one thing for sure, the jokes are cringeworthy. The melody of the theme song… sounds a bit similar to Jay Chou’s “Ju Hua Tai” (Chrysanthemum Flower Bed). [Updated:] After hearing it again, it’s actually only the first line of the verse that reminds me of the Jay Chou song. Although both tracks probably share the same chord progression, they’re actually very different songs and I like them both equally (although I’m not really a Jay Chou fan). Favourite scene: The scenes with Ribbon Ooi sucking lollipops and having her mouth wide opened. Iris Woo: I’ve no idea who she’s supposed to be in the movie ’cause I don’t recall it being explained at all. Her role is dialogue-less and follows Namewee’s character around like a ghost and most of the time she’s just standing straight in the background without any movement. I’m seriously curious what all that is about. Again, maybe I didn’t get it due to my poor literacy in Mandarin but I’m pretty sure it’s not explained in the film. As you can see in the image below (taken from her Facebook Page), she’s quite a hottie and no movie director in the right mind would waste her like this. Some scenes must have been removed, I’m guessing. Follow this blog on Facebook or me on Twitter for updates. cant wait to c it. I think Namewee seems to be having problems living up to Nasi Lemak 2.0! Namewee is my idol, but i do not like this movie, it is not as funny as the previous movies and the story is just too plain and nothing special. But it still worth to go and watch, because you will notice all aspects of the production is getting better, better graphic, better sound quality, better OST. Well i would say almost all directors produced bad movie, but it doesn't stop me to look forward his 4th film next year! Hi, I just recently watched through Namewee’s works and now Kara King. it just my opinion that it so so so much better and a lot funnier than a lot of Chinese movie comedies nowadays. It’s been quite a while that I’ve encountered a movie that could let me have a good laugh from beginning till the end. I’m not sure why many criticized badly about this movie. Maybe people don’t understand the character and meanings of the languages and plot. If u’ve watched Namewee’s Tokok or some interviews, u will know he is a big fan of rock and metal music, and also ghost movie. The biggest intention of the movie is not to convey the spirit of rock here, maybe a part is but that’s not the only one. There are many themes mixed inside, and the big picture is the real environment of what is happening in the entertainment circle, plus other social issues happen in M’sia, he isn’t talking only about rock. From the beginning, the movie talks about criteria selection of candidates in the idol competitions and sometimes even fake thing to create sensation. Everything is based on what can sell to attract audiences. At the end, he said that singing competition is hardly being fair because there isn’t any standard criteria to measure the quality of singing. This unfair here reflects good and bad sides of competition because music is an art. Everyone has subjective view about what they like and dislike. Some lost in competition doesn’t mean it’s bad, it just means that it’s not appealing to majority judges and audiences. E.g. not everyone like rock. Among many genres of music, rock can be considered as the most often group that being misunderstood. U said he misinterpretes the rock spirit, it is not he misinterprete it but this is what it looked like for outsider who dont understand rock and u can’t deny there is a part true about it. The point here is that the rockers do not represent only rockers but also a lot of musicians and maybe entertainers, because of the unsupportive social environment, they are stressed out to find ways in drugs and runaway from reality. In the end, those who can’t overcome it till the end will just give up music, or even other dreams for other ambitious people. He portrays himself as crazy rocker, rude and vulgar, but not a wicked cruel bad person. The same with other rockers. U can see that he, as a rocker, persuades other rockers (musicians) that drugs is not attitudes of rock. This can applied not only to musicians but anyone, that people with wrong mindset will act wrong according to their own perception. Audiences need to able to see multiple meanings behind the plot. I saw some comments from other website saying that there are many pointless characters, mixed languages and the actions too over dramatic. I just wanna say, if not dramatic enough it wont be funny. At least for me, it better than alot of of movies nowadays just focus on fake cgs but not funny at all and meaningless. Mixed languages just reflects the culture of Malaysians. As for pointless character, some said that the non-moving ghost is pointless since she is nobody and no dialogue. Well, i don’t know what character she represents but it adds on a funny element in the movie. What’s wrong if Namewee just want to add some ghost element or even other classic characters into his own work since he is a big fan of ghost movie. All in all, i think the movie is great and funny to enjoy. Not to offense anyone here. Just wanna give some comments when I saw many negative comments about the movie. Plus he also points out the misunderstanding between religions, races, lovers, children-parents and younger-older generations. All the misunderstanding and stereotypes are happening because of miscommunication and majority people might judge a group based on the first impression of one person.